This script gives you the ability to generate the classic US map that has helped convince countless of Americans that Alaska is really an island near Mexico, and not a giant landmass far to the north. -base(-b): Uses Basemap options, you must follow this option with an "O" or "L"
Note, when using us_map.gs, the lat/lon boundaries are set within the script, so you cannot set these before hand. 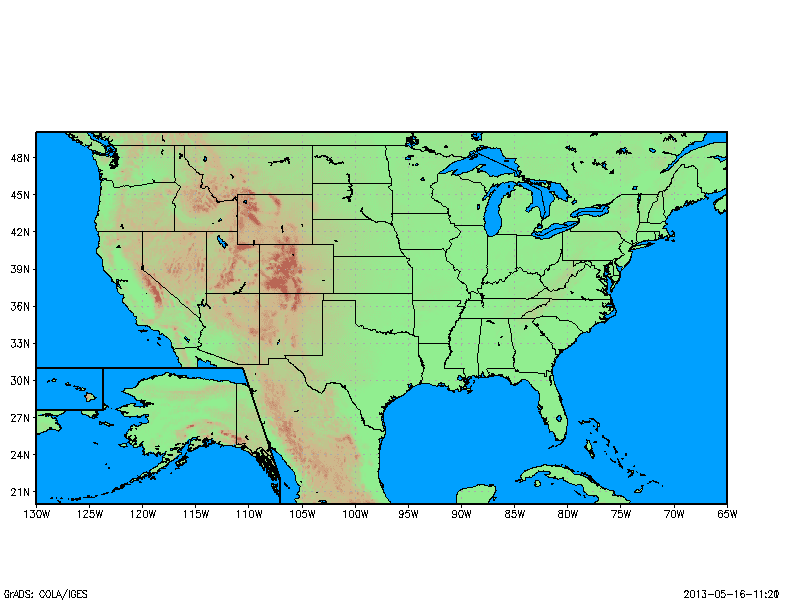 Also, be sure to set your other plot options before using us_map.gs (e.g., page area, contour levels, etc.). Lastly, us_map.gs turns off the x and y labels to plot the boxes for Alaska and Hawaii, so you may need to turn them back on after using us_map.gs. Also, please report any bugs so that this script may be fixed in future versions.